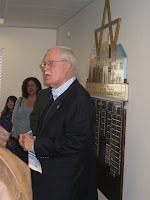 Mayor Harvey Hall gets a lot of chances to cut ribbons and get his picture taken, but next week he'll be given an honor of real substance when he will be presented with the 2009 Hillel Award by Temple Beth El. The Hillel Award honors a community leader who exemplifies the "spirit of the ancient sage Hillel the Elder ... known for his kindness, his gentleness, his concern for humanity, his moral and legal decisions are the cornerstone for Jewish tradition." Previous Hillel recipients include Wendy Wayne, Mayor Bob Price and Dr. Jess Diamond. Like all politicos Harvey may have his flaws - he can be a bit thin skinned - but no one can doubt his commitment to our community and the countless hours he puts in to improve our image both locally and elsewhere. Local political consultant Gene Tackett (husband of Wendy Wayne) will be the event MC and Fred Drew, new CEO over at the Kern Community Foundation, will give the introduction speech. Famous words from Hillel include: "If I am not for myself, who is for me, but if I am for my own self (only), what am I? And if not now, when? ... That which is hateful to you, do not do to your neighbor. That is the whole Torah; the rest is commentary. Go and study it." Temple Beth El is Bakersfield's Reform Synagogue and has been serving the community for more than 60 years. Rabbi Cheryl Rosenstein leads services Friday nights and the third Saturday of the month. Harvey will be honored Thursday, May 14, at the Doubletree Hotel. Tickets run $85 each or $850 a table. For more information, call 661-322-7607.